Vascular development along the anterior/posterior body axis. Somites produce VEGF in response to SHH secreted from the notochord. Endoderm produces VEGF as well. VEGF is required for the development of the dorsal aorta and cardinal veins, following angioblast aggregation . Intersomitic vessels then sprout from the dorsal aorta and cardinal vein in a VEGF-dependent manner, and are guided between the somites. 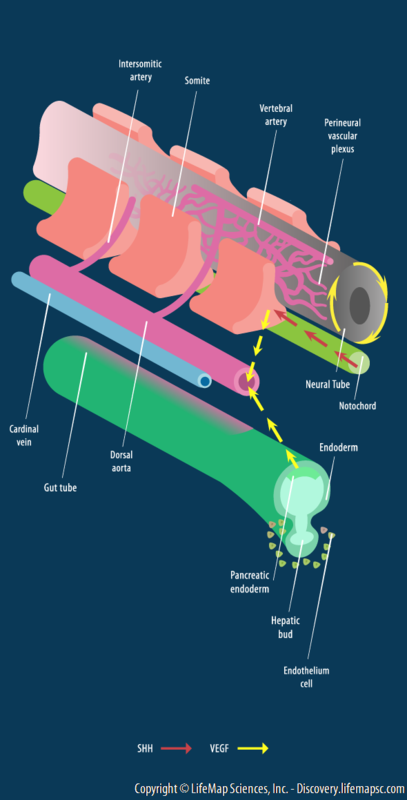 The perineural vascular plexus surrounds the neural tube and is formed by angioblasts migrating, in response to VEGF from the neural tube. The dorsal aorta signals back to the endoderm to induce pancreatic bud formation. Endothelial cells surrounding the prospective hepatic endoderm also provide signals to induce hepatic bud development.